If you have a pond at home, you should be concerned about keeping it clean and well-maintained. This is important not only for aesthetics but to also make sure that it is a healthy habitat for fish and that it won’t be a breeding ground for insects. The good news is that pond cleaning does not need to be a complicated task. It can be accomplished easily even on your own and with the use of basic tools. Keep on reading to know more about how it can be done. 1. Prepare a holding container. 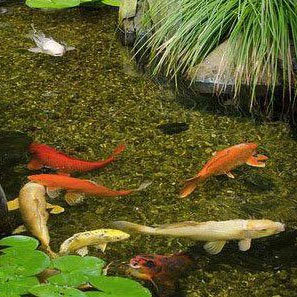 The size must be proportionate to the fish and plants that you have in your pond. 2. Drain water from the pond. You can use a vacuum or a pump to do this. 3. As the water begins to drain, transfer whatever is in your pond to your holding container. 4. Now that the water is drained, start with scrubbing the edges, especially in places where there are sediments that have formed through time. 5. Once you are done cleaning, have it refilled with water. Rainwater is highly-recommended. Make sure that the water will be appropriate for the fish and plants in the pond. 6. Carefully return the fish and plants you have placed in your holding tank. Water should be changed periodically. At least 5 to 10% of it should be replaced on a regular basis. This will be effective in removing contaminants that could possibly endanger aquatic life. Do not remove all algae on rocks. Some might think that algae are dirt. In reality, algae can be beneficial for fish and plants. Nonetheless, having too much algae is bad. Use a hose to remove some algae. Do not smash ice if the pond freezes. Pond cleaning in the winter will most probably require you to melt ice. In this case, putting a hot pan on the surface can be an effective way to melt the ice. Smashing it can lead into producing shock waves, which will be harmful to the fish. Clear vegetation. While it is nice to have plants, make sure that they are regularly trimmed, especially during the summer season. They might consume nutrients that are needed by the fish. They might also make the habitat too crowded for the fish. Use dissolved oxygen. This is one thing that will help you to reduce the growth of algae and will keep the right pH level of the water.